Market State 8A – (26 trading days) Transitional/Bear Market State: The Portfolio Thermostat has been in one of the “Transitional/Bearish” Market States for the last 83 trading days, beginning on August 20, 2015 when a shift occurred from Bullish - Market State 2 to Transitional - Market State 6. Canterbury Volatility Index (CVI 86) – Bearish: Volatility, as measured by the CVI, has now increased 11.7% from the low on 12/2 at CVI 77. Overbought/Oversold indicator (80% oversold) – Neutral/Bullish. An “oversold” (bullish) reading of 95% or higher is considered to be an extreme level. The rare 2.05% gain in the S&P 500 on Friday, December 4th, is NOT a bull market characteristic. The following two Fridays have also had 2% moves but down, not up. The equity markets remain in a Transitional/Bearish Market State environment. Expect random “kickback” rallies but the risk remains high. The Portfolio Thermostat has only experienced two “Transitional/Bearish Market State” periods since the end of the infamous 2008/2009 stock market meltdown. The first Transitional/Bearish Market State environment was in 2011 and lasted 87 trading days. During that time, the Portfolio Thermostat’s indicators never shifted to a full-fledged “confirmed” Bear-Market State (Market States 9, 10, 11 and 12). The S&P 500’s highest peak during this first Transitional/Bearish period was registered on 4/29/11 at 1364. The lowest low was on 10/3/11 at 1099. This calculates into a maximum peak-to-trough decline of 19.4%. The second and current “Transitional/Bearish Market State” environment began on August 20th of 2015. It has lasted for 84 trading days and counting. 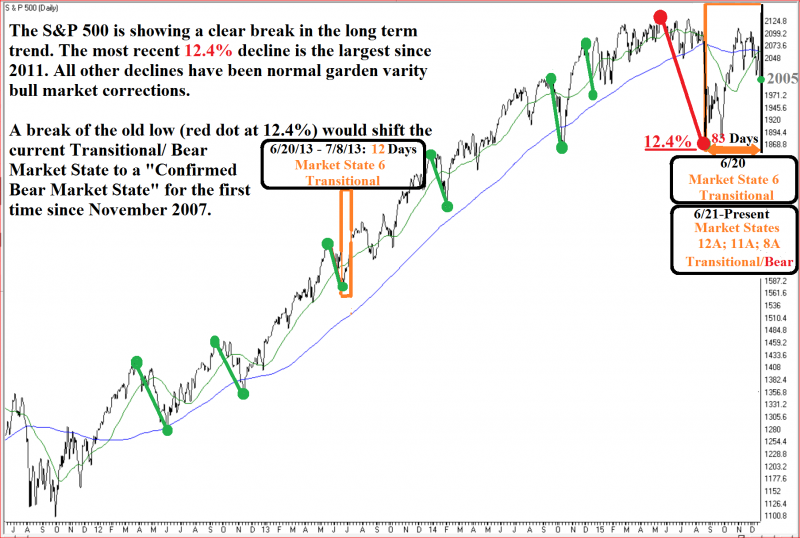 The current Transitional/Bear is just 3 days short of matching the 2011 Transitional/Bear period. So far, the highest peak-to-trough decline (drawdown) has been 12.4%. The current maximum decline is 7% less than 2011. That being said, the current “Transitional/Bear” has yet to show any meaningful indications of nearing an end. In other words, the current Transitional/Bear will last longer than the one in 2011 and will most likely have more downside to come. 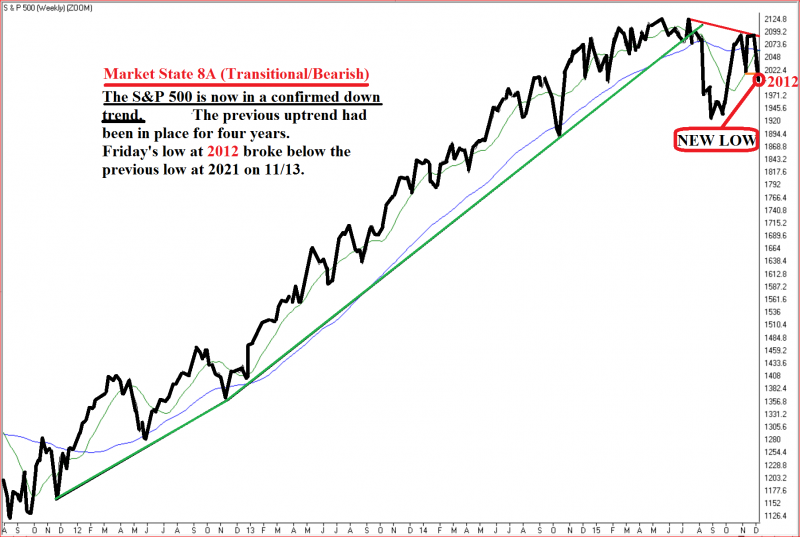 The chart below shows the first break in the long-term upward trend since 2011. As a result, the Portfolio Thermostat’s ETF holdings continue to be positioned to produce a stable portfolio, regardless of what the markets have in store as we enter 2016.